As you’re undoubtedly aware, the City of Boulder has mandated that homes with wood roofing in the city limits are required to be replaced by January 1, 2014. The countdown is getting lower every day! We can take that stress off your shoulders by taking care of it for you! Schroeder Roofing has been handling roof replacements and repairs of all shapes and sizes since 1977. We’re a locally owned, Colorado Proud company and our BBB A+ Rating speaks to the 100% satisfaction guarantee that we offer each and every home and building owner who’s roof’s we care for. 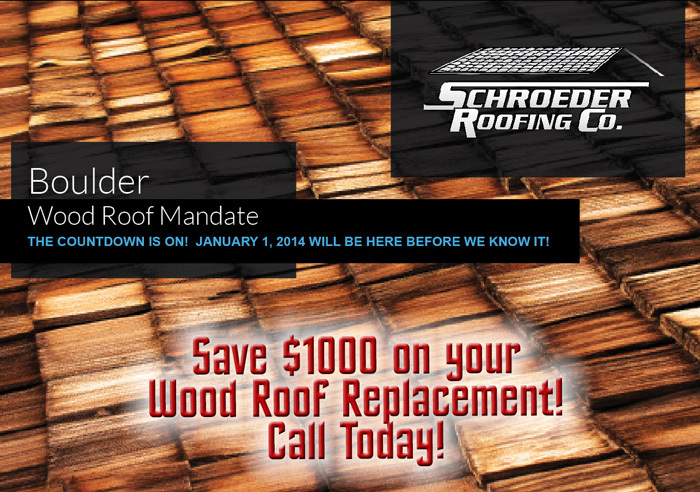 As an added incentive, we’d like to offer you a discount of $1000 on your wood roof replacement. Act now to guarantee you can have the roof replaced in time! For an example of our work, please click here to see the types of homes and buildings we’ve worked on recently. Our estimates are always free and we’re happy to offer help with insulation needs, gutter repairs and any other roofing needs you might have.